We understand ceremony and we focus on it. Like a good meal, a good ceremony depends on its ingredients and how it is put together. Our Diploma Courses are about the Rite of Passage components – poetry, music, choreography, symbolism, story-telling, creative writing, tradition and history, creativity and innovation and how these all come together in powerful ceremonies. We understand the dynamics of culture, the public need of the psyche to have witnessed endorsement, approval and support. We have seen the effect good ceremonies have on individuals, communities, and societies. We understand these effects – they inspire us..
We absorb the insights of the best authors and we learn from them – e.g. Arnold Van Gennep, David Oldfield, Joseph Campbell, Mircia Eliade, Ronald Grimes, Robert Fulford, Juliet Batten, Jonathan Franzen and many others – inspiring ideas and ideals which motivate us to be better people – better celebrants. 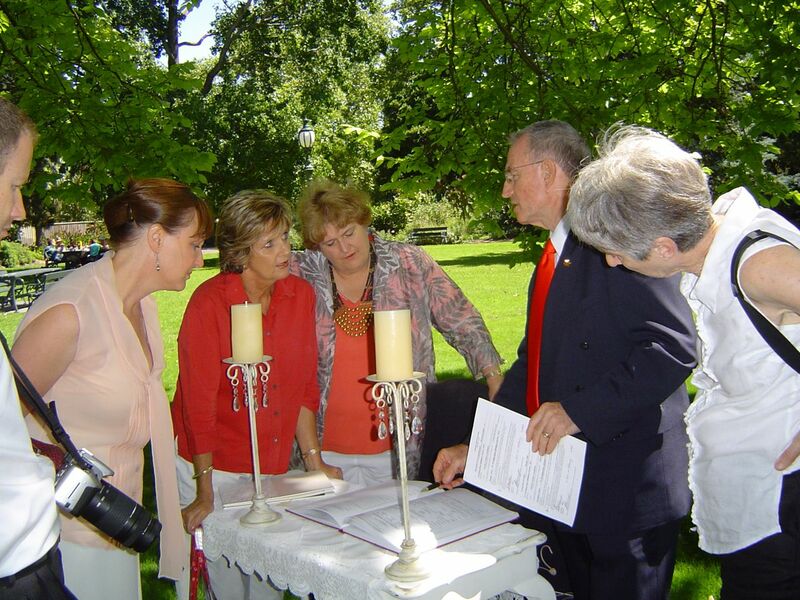 We are practical – our fieldwork requirements concentrate on the practical skills a celebrant must have. Basically – four Diploma Courses are arranged on a framework of Eight Modules. The College is the place to find Best Practice Celebrant Education. We have been actively developing our Diploma courses and improving them since 1995. These are the courses for you. We know they are, by far and away, the best courses in celebrancy which exist. Celebrant, having just completed a marriage ceremony, is explaining procedures to students and new celebrants. Because we have students all over the western world we teach mainly by Assisted Distance Education using every communication means available – Post, Phone , Skype, Email, Dropbox, SMS. Your Assignments and Fieldwork Reports are read with attention to detail, critiqued and then assessed by our Dean of Studies, Dr Chris Watson. We aim to serve students everywhere in the western world – including those who live away from the big cities in various countries. Face-to-face classes are often provided in Melbourne and Sydney, Australia. Assisted Distance Education is not just a “Correspondence Course”. It includes Fieldwork, that is, observing, reporting, researching, and interviewing celebrants in the field. Every one of our students is supported by a team of personnel and generous graduates who will readily lend assistance. Each Diploma Course involves real ceremonies, getting to know your colleagues, who are experienced celebrants in the field and reporting on simulated or real ceremonies performed by yourself as a celebrant or student- and a lot more. Ceremonies and their purpose infiltrate deep into individual lives; they enrich the culture and the life of communities. Transformative education and training in this field takes time. Our courses offer you the opportunity to take the time so that you will become an inspired and skilled celebrant. You will make a difference to the lives of your clients and you will bring a level of happiness to them. It is hard to imagine a more worthwhile vocation. For a better idea of what is involved, have a look at our list of Diplomas, and read a more in-depth description in our 8 Modules. Signing up for the course is dead easy. Just fill in this form and pdf it to us (or simply give us the information we ask for in a simple email). Need to talk to someone or contact anyone? Contact us. Being a Celebrant – Superficiality or Depth?